Size: about 15 inches tall (head to toe) with chunky yarn. 19. *sc2tog* repeat around (10) I attach the muzzle here and then put the eyes on and then stuff. 20. *sc2tog* repeat around. End off, leaving a long tail. There will still be an opening so I just weave the yarn through each stitch around and pull closed. 26. *sc2tog* repeat around. End off leaving long tail. Weave through remaining stitches and draw closed. Bottom of foot: This is where I used the different coloured yarn. 3. sc in each st around If you are using a different colour for the bottom of foot, join original(body) colour in same st as last sc and sc. 29. [sc2tog] 8 times, 1 sc in last st (9) End off, leaving long tail and weave through remaining stitches then draw closed. You could even make 2 small ears in one colour and make 2 bigger ears and then sew the smaller ears onto the bigger ones. 4. 1sc in each st around. End off leaving long tail to sew to head. Embroider nose and mouth. Sew muzzle and ears onto head, then sew the head, arms and legs onto the body. Copyright Amber deGoutiere 2011. This is my own original design. Please do NOT claim this pattern as your own or sell it. However feel free to use for personal use, gifts or charities. This is adorable! Thank you so much for sharing it. Love your bears very well done. Hi l love your bears. I love your bears. I have recently written my first pattern and have been wondering whether to post or not, but now I’m feeling inspired. Thank you for posting yours. This is super cute! Thank you for being so generous and sharing your pattern! For those who have not done this before like myself, could you please include how you sew the parts together. They are very cute. thank you 🙂 I am glad you liked and used it.. I would love to see the one you made. Question: How do you get your bears stuffing to come out so “smooth”? I’ve stuffed animals before & get lumps all over or here & there so I gave up on stuffing things. Would love to make a bear. Very good crocheter. Sorry for the late reply. To get it smooth I use alot of stuffing.. or stuff until the piece is firm and I squish it around as I stuff, if that makes sense. I have had trouble with bears looking lumpy as well lol and that’s the best way I have found. 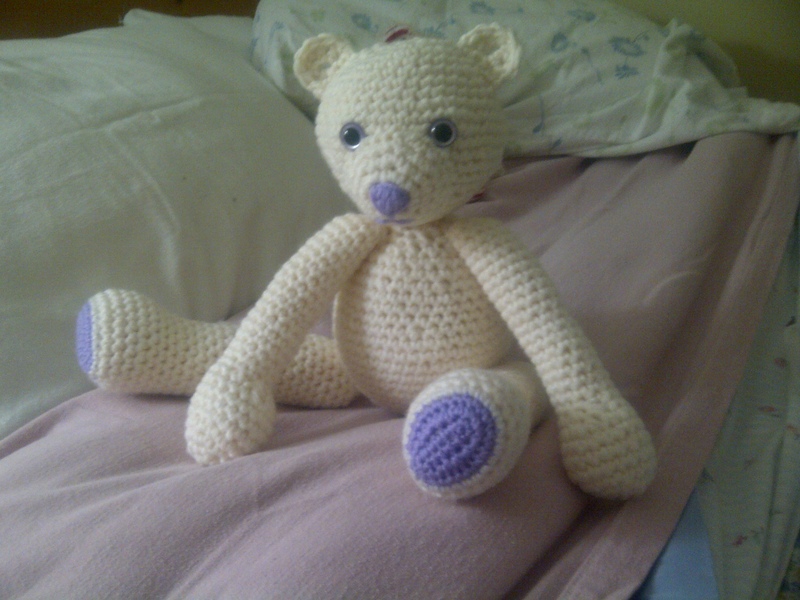 I am making this bear for a friend who is having a baby, and it is turning out to be one of the cutest things I have ever made. I will use this pattern again I am sure! Love it!!! This is the first time I’ve tried to make anything that was stuffed. Once the bear is stuffed you can’t just toss it in the washing machine right? Have you ever washed the pieces before stuffing them to soften them up? What size needle did anyone of you use? How large, tall did the bear turn out to be? I said the approximate size in the pattern. 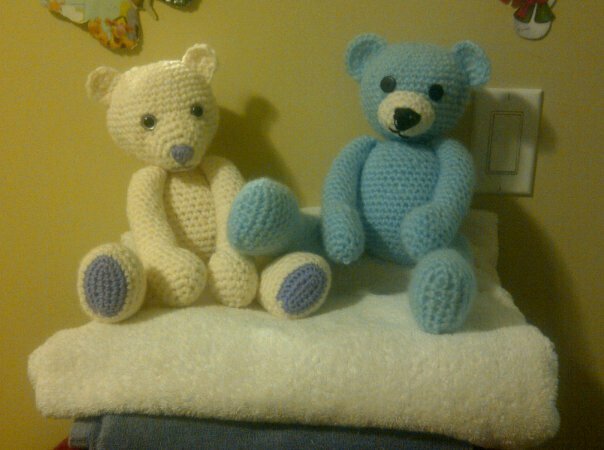 The smaller the yarn and hook the smaller the bear, and vice versa. As for hook, generally a 4mm is a good choice for WW or even chunky yarn. 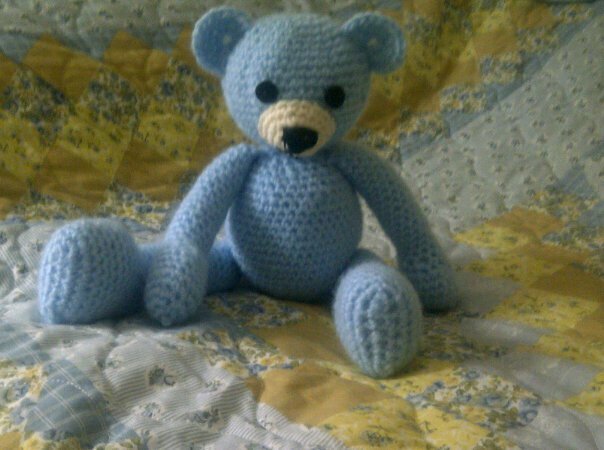 Thank you so much for posting, I just finished making one of these bears with blue and cream worsted yarn. So cute, I’d send photos, but there isn’t a submit button? Not sure if you’ll be able to look at this, but here is a link to an almost finished product photo. There are just a few changes, it’s my first time following a pattern. Awww he is precious! thanks for showing me a pic 🙂 Im not sure how to put a submit button.. kinda new to blogging lol. I love your bears! I finished a different bear for my cousin’s little boy, but I can’t wait to start this one. Very sweet! I volunteer at a local museum and teach crocheting. I’ve used your patterns as references for the students to go by. I’ve encouraged them to keep looking at what you’ve got since the instructions are easy to follow and the end results are great. Many thanks for making my job a whole lot easier!!!! Wow, thank you. Such a compliment to have my pattern be used for teaching! The problem I’m having with the pattern, I’m using thinner yarn and need to compensate with more rows to get it to even out. I love this! Thank you for sharing. I’m new to crocheting and was wondering if u can link me your tutorial on how you assemble with the muzzle and ears. I haven’t gotten around to making a tutorial on attaching the muzzle and ears (I will do that soon though!) Basically what I do is I pin(i use a bobby pin lol) the opposite side of where I am going to begin. For the muzzle- I leave a long tail when I end off. I put it on the face where I want and with the end tail I go into the head, back up and into the st next to where the tail end was. I do this all the way around. Before I close the muzzle, I stuff it lightly to give the nose some definition. For the ears, I again leave a long tail. I weave in the end I had from the beginning and pin the opposite side I am going to start with. I usually have the ending tail on the bottom, but really it just depends on what looks better to you. You will be working on the side of the ear. I go into the head, back out and into the next side st. do this in all side sts until ear is attached. I do a knot then weave the end in so you don’t see the knot and ends. I hope this is clear. I am going to try and get a web cam so I can actually do some vid tutorials so it is easier to understand. I love your teddy bears, but am having a problem with the pattern. The head turns into a flattened tam. I stuffed it, but it still is not a ball shape, not really round. Could that be because the decrease rows come on so soon. I’m thinking I should go back and do more rows of sc in each st after row 17 before beginning the decrease rows. What are your thoughts? Hmm. i have made this bear quite a few times and never had a problem with the head. Are you sure you’re following the pattern properly? If you add too many sc rows it will end up oblong instead of round. Maybe try again and if it doesn’t work for you then try adding what you want to see if that helps? Thank you, Amber! I love these bears. I’m making It for the second time now – this one is for an 84 year old friend of mine who was sick as a baby and has the mind of a three year old. She loves watching the bear emerge from the yarn. She is sick right now and it is good for her to have a little distraction while we sit with her. Thanks again for sharing your pattern. Aw thank you. I am glad that she finds joy in watching you create a teddy bear- esp from my pattern. Thank you for sharing that with me. Omg I LOVE you! U don’t know how long I have been looking for a pattern like this sooooooo easy to follow and u can tell it comes from love! Bless you! You have a new fan ! Ty! You’re very welcome and what a great idea! Thank you so much for sharing this adorable pattern. I made one for my 1 yr old and she loves it. I’m so glad you like! I would love to see the one you made! 1. ch 7. 1sc in second ch from hook, 1 sc in next 4 ch, 4 sc in last ch. Turn and work on other side of beginning chain. Thank you for this cute pattern, it will be great for another teddy bear patter for my Shriners Charity project!! Thank you. I’m glad you like! Thanks for the Lovely pattern! Was very easy to follow! I did have to shorten the legs though seemed a tad out of proportion to the body and I may have made the ears too big…my bear now looks like a mouse…ah well! Final assembly will be tomorrow, adding a Lavender scented satchel to the body for calming. I cant wait to try this!!! Thanks for sharing! Just love this pattern. Bit having trouble to print it of. I’m a beginner and made the teddy bear in dark brown,it’s the best one, thanks for sharing.Easy instructions. For rows 1 and 2 of the legs, could you make a video? I’m having a hard time figuring it out. Hello. I am trying to crochet this bear, and so far it is going great! (I’m new to crochet) I have a question about the arms. On step 18 you state to “not close”. So, do you mean for us to sew the open arm to the body? Can you please expound on this a little more? Yes, you leave it open. Hold the arm flat on the side of the body and sew across the arm going into the body. thank you very much. I LOVE how this is turning out, and it is fun to do. At what row do you put the eyes and how many stitches are between them?